Anjali learning at school in Rajasthan. Anjali is a 9 year old from Rajasthan, India. She loves drawing, watching movies and painting her hands with beautiful henna designs. She goes to school every day and her parents support her desire for education. 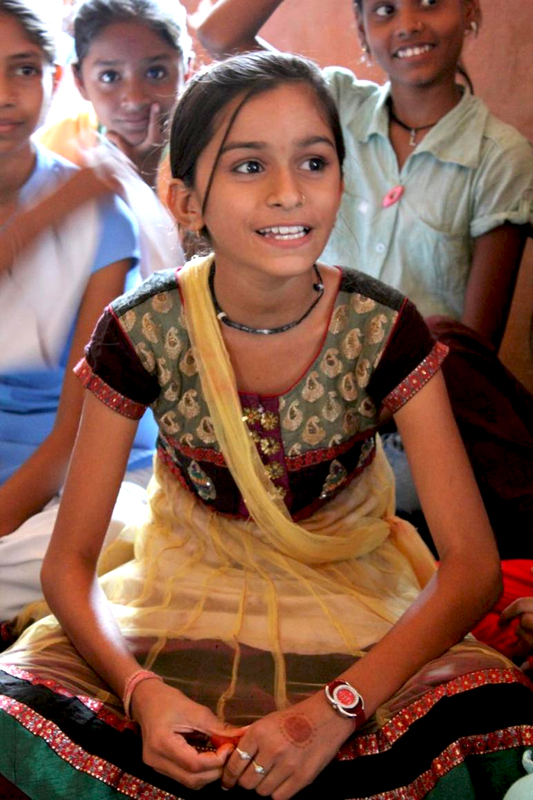 Anjali is lucky because not every girl in her village has the opportunity to study. Her cousin, Rani, who is just one year older, got married last summer. In a couple of years, Rani will leave her parents’ home to move with her husband’s family. In Anjali’s school, there is a girls’ parliament called the Bal Sabha (Girls Council). During Bal Sabha sessions, young girls are taught life skills. They have the opportunity to speak up about their concerns, and by doing so, they gain confidence. Anjali really likes being part of the Bal Sabha. She particularly enjoys the dance and theatre performances they put together. Two months ago, the Bal Sabha girls presented a short play in front of their classmates. Anjali was playing a Team Balika Member visiting a house where a young girl was about to get married. Anjali’s character had to convince the parents to stop the wedding from happening and to send their daughter back to school instead. The issue of child marriage is quite problematic in the region, and Anjali had to use many arguments to explain why girls should get educated instead of being married off so early. The story had a great impact on the audience and many students had something to recount at the end of the performance. Since Educate Girls started its program six years ago, almost 11,000 girls have been trained as Bal Sabha leaders in the districts where Educate Girls works. These young girls grow up educated and confident, with knowledge and skills that will help them throughout their lives. Since the play was performed, Anjali talked to one of Educate Girls’ volunteers. She mentioned her cousin’s marriage and the fact that Rani didn’t go to school any more. Our volunteer has been to Rani’s house several times to talk to her parents. After much persuasion, they have finally agreed to send their daughter back to school until the time comes where she will leave their home. Now Rani and Anjali walk to school together, play and do homework in the evening.